Qatar said hackers posted fake remarks by its Emir criticising U.S. foreign policy on Wednesday in an incident which renewed tensions with fellow wealthy Gulf Arab nations just days after President Donald Trump met with regional leaders. Gulf Arab countries including oil giant Saudi Arabia permitted their state-backed media to run the remarks attributed to Sheikh Tamim bin Hamad al-Thani on Qatar's official news agency even after Doha had issued a robust denial. The development signalled a possible revival of a 2014 rift between Qatar and its neighbours over Doha's backing of Islamists and suggests behind-the-scenes disarray among U.S. Gulf allies after Trump's visit to Riyadh this week. Disputes between Gulf Arab states can have significance far beyond their energy rich region. The report said Sheikh Tamim, in a speech to a military graduation ceremony, was critical of renewed tensions with Tehran, expressed understanding for Hezbollah and Hamas, and suggested Trump might not last long in power. But Saudi Arabia's Okaz daily thundered: "Qatar splits the rank, sides with the enemies of the nation." Riyadh's Arab News said the comments sparked "outrage" among other Gulf states. An official in the Qatari Foreign Ministry expressed "surprise at the position of some media and satellite channels." 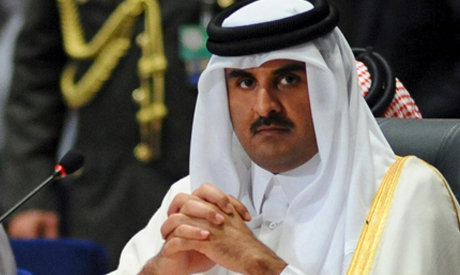 Qatar will track down and prosecute the perpetrators, the statement continued. Authorities in Saudi Arabia and the United Arab Emirates (UAE) blocked the main website of Qatar's al Jazeera television, which Riyadh and Abu Dhabi have often seen as being critical of their governments. Al Jazeera says it is an independent news service giving a voice to everyone in the region. The incident happened days after Qatar complained it was the target of "an orchestrated barrage" of criticism by unknown parties in the run-up to Trump's visit alleging the Gulf state supported militant groups in the Middle East. "The reality is that the region is on the verge of further escalation," a Western diplomat in Doha said. "It's total chaos and no one has vision." The falling out is especially awkward for the Gulf Arab states after their leaders met Trump last weekend at a Riyadh summit of Muslim nations meant to showcase solidarity against Sunni armed militant groups and Shia regional adversary Iran. In Riyadh Trump renewed his assertion that Iran was a leading state sponsor of terrorism. Iran denies that and says Saudi Arabia, the dominant GCC power, supports militant Islamist armed groups such as al Qaeda and Islamic State. Riyadh, in turn, denies that accusation.